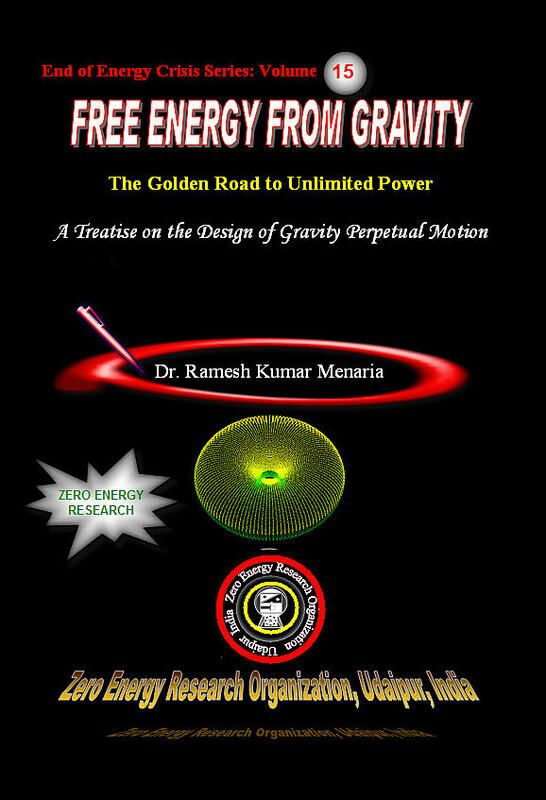 A Treatise on Design of Gravity Perpetual Motion, “Free Energy from Gravity"
Perpetual motion, possible or impossible? behold the Nature, perpetual motions well visible! Let us imitate, build one, which is the best!! ....The book is first study of its kind on the construction of perpetual motion machine. The study combines both the empirical and practical approach to design perpetual motion of all kinds for all purposes. For the first time an attempt has been made to provide a comprehensive and workable solution todate problem of energy crisis in the world of fast growing demands of energy. Perpetual motion machines are pretty simple to design. It is truly an addictive way to design and create because you can create energy without expending any thing .It sounds tricky, but it is very simple. Perpetual motion can take many forms as we have different types of forces at our disposal. There are a number of ways of doing this, the most popular being an overbalancing wheel. Thus, our main focus is on gravity perpetual motion machine. To produce a good perpetual motion machine you need a diverse range of skills. A perpetual motion designer often wears many hats. These skills may be available in a single individual or more likely, in a composite of individuals working as a team. Before beginning a perpetual motion design, we must first develop a sense of its scope and content. It’s essential that we develop an organized outline and a plan that rationally details the skills, time, budget, tools, and resources at hand. While designing a gravity motor, the most important factor to be kept in my mind is power, which is measured in watt. Depending on our energy needs, size of a gravity motor may vary from a single toy machine to an array of gigantic gravity perpetual motion machines capable of producing thousands of megawatts of electricity. .....I have endeavored to place clearly and candidly before the intelligence of the reader the principles, techniques, and the methodology that I have adopted to design gravitational perpetual motion machine, which can prove to be a big success if your insights will further develop them to compete with rest of energy generating technologies in free energy field.. Taking inspiration from Orffyreus’ perpetual motion machine, you may attempt to construct your own gravity motor. In this volume, you will be introduced to the workshop where it is made. The most precious asset you can bring to the perpetual motion workshop is your creativity. This book provides guidance and suggestions for getting started. If you want to create gravity motor yourself using your own ideas and talents, check your skills against those described in this book. Once you get started, you have lot of room for creative work, because the rules for what works and what doesn't work are still being empirically discovered; I have only discovered few formulae for the initial success of perpetual motion. You do not have to be an engineer or a great technician to make perpetual motion work for you, but you need some familiarity with simple machines and with their operation. From plumbing to perpetual motion, learning is a matter of time and practice. If you devote a good time to perpetual motion, you are sure to become a good perpetual motionist. You need talent and skill. You will need time and money for the purchase of different material. Materials described in this book can be easily obtained from a suitable shop. You may also need help of other people. Huge design of perpetual motion wheel requires teamwork. Welder will perform welding work, Mason will do masonry work, and Lathe machine operator will do his work, Late nights are often involved in the making of perpetual motion machines. And once you raise a gravity perpetual motion machine to meet your energy demands at your home, industry or farm, arguments of the energy planners in energy circles - that it takes some 25 years for a new source to be researched, developed and promoted to a point where it comes to a meaningful contribution to the society- holds no ground. Perpetual motion is an instant solution to all our energy problems. Since energy from the gravity motor is far superior to all existing sources of energy, to those faced with making choices- perhaps, about the future investments or about where best to direct the research effort, or about when participating in a debate over energy policies or about to be better informed on a subject of personal interest- there will be no much greater uncertainty. Technique of the perpetual motion can be easily exploited commercially. Are These Theories Adequate To Explain Gravity? We need to start action NOW. 9 WHERE DOES ENERGY COME FROM?